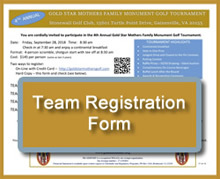 You are cordially invited to participate in the 4th Annual Gold Star Mothers Family Monument Golf Tournament. 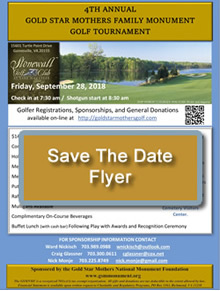 Enjoy a day of golf and fellowship at the same time that you help the Gold Star Mothers National Monument Foundation raise funds for a monument to honor Gold Star Mothers and Families adjacent to Arlington National Cemetery. 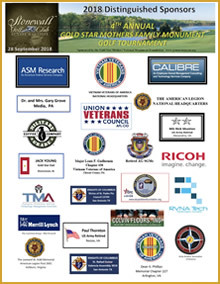 The Tournament is conducted to help raise funds for the Gold Star Mothers Family Monument which has been authorized by Congress for placement in the National Capital Region through the use of private funding only (PL 112-239). Register no later than September 17, 2018. Pay by Check. 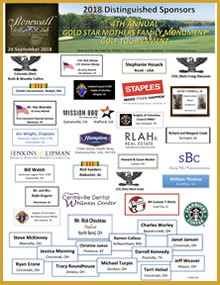 MAKE CHECK PAYABLE TO "GSMNMF"
Please look over the list of sponsorship opportunities and let us know if you will be able to support the 4th Annual Gold Star Mothers Family Monument Golf Tournament in any one or more of the opportunities. For clarification: Fill out the Sponsorship Form, save it on your computer, or pay online by clicking on the button below. 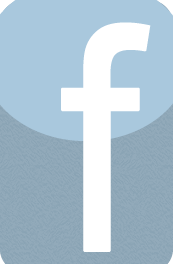 ***Listing of Sponsorship availabilities on this web page will resume in 2019. 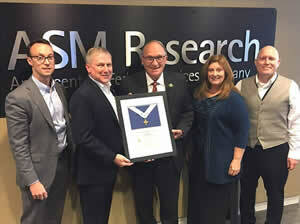 (second on left) and his management team by Ward Nickisch (center), Co-Chairman of the Gold Star Mothers National Monument Foundation in appreciation for their continued outstanding support as Platinum Sponsor of the 4th Annual Gold Star Mothers Family Monument Golf Tournament in September 2018. 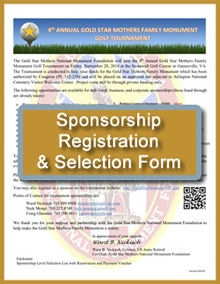 ASM Research has been one of the major sponsors each year since the tournament's inception. 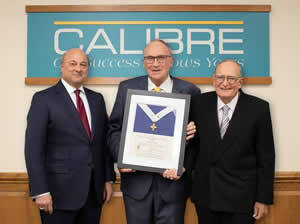 The Gold Star Mothers Distinguished Service Medal (2nd Award) is presented to Mr. Joseph Martore, CEO of Calibre Systems (on left) and to LTG (Ret) Terry Scott, Chairman of the Board (on right) by Ward Nickisch (center), Co-Chairman of the Gold Star Mothers National Monument Foundation in appreciation for their continued outstanding support as a Sponsor of the 4th Annual Gold Star Mothers Family Monument Golf Tournament in September 2018. Calibre Systems has been one of the major sponsors each year since the tournament's inception. 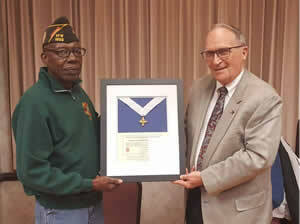 The Gold Star Mothers Distinguished Service Medal is presented to Commander Thomas Williams, Jr. of VFW Post 1503 (Dale City, VA) by Ward Nickisch (on right), Co-Chairman of the Gold Star Mothers National Monument Foundation in appreciation for the outstanding support by Post 1503 as the foundation works to establish the Gold Star Mothers Family Monument on an approved site adjacent to Arlington National Cemetery.